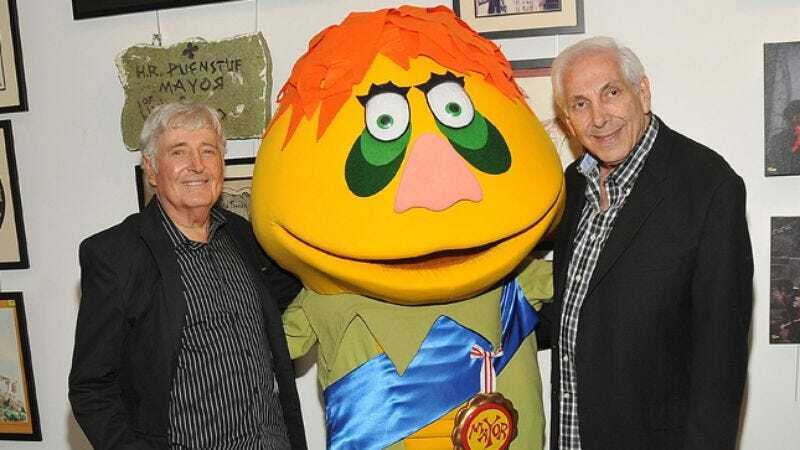 Although siblings Sid and Marty Krofft started working in show business several decades before they made inroads on the small screen, by the time the ’70s rolled around, they were the uncontested sovereigns of Saturday morning. After creating a cornucopia of classic series, including H.R. Pufnstuf, Lidsville, Sigmund And The Sea Monsters, and Land Of The Lost, the Kroffts made the jump to prime time, producing variety shows for everyone from the Brady Bunch to Barbara Mandrell And The Mandrell Sisters. In recent years, Sid and Marty have taken a step back from working on new properties, instead turning their attentions to repackaging their ’70s shows—the duo signed a deal with Vivendi Entertainment which thus far has seen the release of H.R. Pufnstuf: The Complete Series as well as a single-disc best-of collection, Sid & Marty Krofft’s Saturday Morning Hits—and transforming more of their past successes into feature films. With the reissue of Sigmund And The Sea Monsters: Season 1 on the horizon, the Kroffts spoke with The A.V. Club about what the future holds for H.R. Pufnstuf as well as the origins of their career, their disappointment over the Land Of The Lost movie, and the fine line between Charles Nelson Reilly and the character he played on Lidsville. The A.V. Club: The first season of Sigmund And The Sea Monsters is being reissued on DVD. Do you enjoy the opportunity to revisit these properties when it comes time to compile sets like this? AVC: Sid, you started in vaudeville, but you also did a stint with the Ringling Bros. And Barnum & Bailey Circus, correct? Sid Krofft: Yes, I did. In 1946 or 1947. In the sideshow, actually, not even knowing that that was a show full of freaks. I saw ad in Billboard, which at that time was for carnivals and circuses, and they were looking for unusual acts. I was just 16 years old, so without even telling my parents, I went and auditioned with my little tape recorder, and they said, “Well, you’re going to be opening in two days,” and offered me $75 a week, which was a fortune. I had another brother, two years older, who had a job where he had to take a subway all the way downtown for only $35, so 75 bucks? That was a fortune! I traveled with them, but I never finished the season, because it was a very, very hard life, especially for a young kid. I was rejected by all of what they called freaks, because they felt that I didn’t belong. The show opened in April, and I left in September. But we traveled all over the country, and we would just stay in cities for a day, and it was pretty rare that we were there for two days. What people don’t realize is that the big top held 15,000 people. It was a five-ring circus traveling with 2,000 people. It was quite an experience. AVC: What was your act like at the time? SK: Well, I was totally self-taught, so I had things like two rumba dancers, a breakaway skeleton, two minstrel dancers, and a juggler. When I was 11 years old, I saw a puppet act at a theater in Providence, Rhode Island, which was the first vaudeville show I ever saw, and I thought, “Oh, my God, that’s something I want to do for the rest of my life!” [Laughs.] And then in the very first Superman comic book, I saw an ad in there for a Hazelle marionette for $15. Of course, my family and I didn’t have $15, but there was also an ad to sell Christmas cards for 50 cents a box—this was in July—and you could keep a quarter. So I went into the streets and sold my Christmas cards until I saved $15, and that’s how I sent away for my first puppet. After I got my first marionette, I went back on the streets with my little wind-up Victrola, and it was like a little street act, selling Christmas cards. My sales tripled! Here’s this little tiny kid working with puppets. Nobody had ever seen anything like that. So it all started with that. And the circus—well, I used to do little shows for $3 or $4, and then we moved to New York in 1945 and I got myself an agent. [Laughs.] And I was doing shows for, like, 10 bucks. Maybe 12. But 75 dollars from the Ringling Brothers circus? The circus, really, was the foundation for my whole career. I mean, that’s where I learned so much, not even realizing it. But I was self-taught, and I created everything myself, made my own costumes. The ideas all came from me. I had no help. I chose my own music. MK: You could do a whole story just on the circus. MK: No, I don’t mean you. AVC: He’s right. Your life in the circus, that’s an article in and of itself. A movie, even. SK: Oh, yeah. Well, we did a movie in 1981, a Movie Of The Week for NBC that was called Side Show. But in those days, Standards And Practices wouldn’t allow you to get too deep into the stories, you know? I mean, we wanted to call it Freaks, but they wouldn’t even allow that word, so it was called Side Show. But anyway, after the circus, the ball started rolling, and here we are. AVC: So what brought the two of you together as an act? SK: Well, in 1958, I was with Judy Garland. I was the opening act for Judy Garland, and at my last engagement with her at the Fontainebleau Hotel, I lost my assistant. And Marty, who was quite a businessman himself in New York, he was—how old were you, Marty? 19 or 20. And he was the leading car salesman for Ford in New York. This young kid. And so he came and joined me as my assistant. But it wasn’t until I think eight or maybe even close to 10 years later than Pufnstuf happened. AVC: You guys designed the costumes for The Banana Splits, but did you have anything to do with the show beyond that? SK: Well, what happened was, we had what we called the Show Business Factory. It was financed by Six Flags, because we had a show there. Angus Wynne, he owned Six Flags, and he set us up, and we became the creative team for the park. We built rides, whatever they needed. We had over 250 creative people. It was like a mini-Disney operation. We had every department. And so when they walked out with all their stuff that they needed for the season, Marty and myself didn’t want to let anybody go, because we had some of the most creative people in Hollywood. So we opened up our doors to everybody. Ice Capades, Ringling Brothers. The Queen Mary, when it first arrived, we were the designers for that. So many, many things. Earth Wind & Fire, the Jackson Five, everyone was coming in to have us build their stuff. And so we came up with Pufnstuf. That was our first show. Actually, you know, we never did a pilot. We did this fabulous book, a huge book with all the characters, and we told the stories to the executives in their offices, and then we threw the book down. And that was how we sold our shows. And they waited for us every year, to see what the hell we were going to come up with next. It was wild. Just one show after another. And, geez, when I look at the list, I didn’t realize myself, but we did something close to 50 shows and specials for television. It’s amazing. AVC: What was it like to finally be able to create your own universe with Pufnstuf? SK: Oh, my God, well, it’s your first child, you know? It’s amazing. And we knew nothing! Marty even said, “Hey, we don’t know anything about making a television show. Sid, you better go to the library and get a book!” [Laughs.] I mean, we came from live theater. Marty, say something! MK: Well, you’ve been talking! He hasn’t even gotten to ask any questions since the one about the circus. “Hey, let me talk about the circus some more!” I’m only kidding. MK: Oh, let’s get off the circus. SK: No, I’d say it was a very important part of my life. And it was the groundbreaking thing for what we’re talking about! I mean, that was the foundation of how we came up with all these crazy things. I think that’s a very important part of my life. I mean, Marty wasn’t involved, but… okay, we’re off the circus. AVC: Okay, Marty, what was the creation of Pufnstuf like for you? MK: Well, what I did was, I took this thing from a puppet act to a business. Okay? That was my initial contribution. Pufnstuf came out of the World’s Fair in Texas from the year before, in 1968, and we did a pavilion for the Coca-Cola company, who had done business with us where they sponsored our shows at Six Flags. So we did their pavilion, and that’s where Pufnstuf was born. So when we did The Banana Splits for Hanna-Barbera, NBC and Kellogg’s would come by our place and see the progress. So the head of programming said, “Why don’t you do your own show?” So we used Pufnstuf the character, and then we gathered all the troops to do our first series. I think I sent my sister out to get a book about how to produce a series, because we didn’t know how to do it at the time. So we were learning on the job. So Pufnstuf was really the beginning of our television career, other than that we’d done some guest-star appearances with the puppet on Dean Martin’s show and several others prior to that. AVC: Given the limited experience you had in the field, are you surprised that you did as well as you did? MK: Well, what I first did was—I was friends with Si Rose, who had produced many sitcoms and was successful, and he was actually winding down. He made so much money that he probably didn’t want to work anymore. So I asked if he would come about and help us produce the show, and he was the big difference. He was a writer and a producer, and he was very funny. He was involved with our first four shows. You know, when you do television or movies, you’re not doing this alone. This is not like Picasso going in a closet and drawing a picture. We surrounded ourselves with some great people —artists and producers and directors—and we just had the best people. When we did Land Of The Lost, Star Trek: The Animated Series was cancelled that year, so we got most of the Star Trek writers. We were always getting great people and bringing them into our camp. MK: Yeah, it wasn’t done for $54,000. The network gave us $54,000. SK: Yeah, that’s what they gave us. MK: We’re still paying the dues for Pufnstuf. That cost $100,000 an episode. I guess today that would equal about $600,000. SK: No, it would be $2 million. MK: No, it wouldn’t be $2 million. But it would be a lot. AVC: You’ve said many times that, despite people’s suspicions and concerns, you were not on drugs when you created these shows. But were you at least conscious that people might think you were? SK: Well, we were always accused of that. But hey, three presidents said that they smoked pot. It was the ’70s. It was a psychedelic period. MK: The bottom line, basically, is that we weren’t on drugs. If we were on drugs like they say we were, we definitely would be dead today. Okay? Maybe all of the college kids, they might’ve been on drugs while they were watching it. AVC: Oh, they definitely were. MK: We didn’t know we were having that influence, though. We didn’t do our shows directed at drug connotations. SK: It was amazing how, at the end of the show, Pufnstuf would say, “Keep those letters and postcards coming in!” And it was crazy: We were getting up to 10,000 letters a week, you know, and most of them were from college kids, ’cause they’d get up on Saturday morning and watch it. Like they did with Pee-wee’s Playhouse. It was the thing to do on a Saturday morning, regardless of being a kid or an adult. AVC: With Land Of The Lost, you had Will Ferrell in the lead role, which is dream casting for a comedy, but was there ever any talk of taking the property more seriously? Because you had some top-notch writers on that series, and there are some surprisingly solid sci-fi concepts going on if you take the time to look for them. MK: Right. Well, what happened was, I was working mostly with our managers, and I really wanted Will Ferrell to do the movie. [Laughs.] Not knowing what was going to happen. And once we got underway, it’s like once the train’s out of the station, you can’t bring it back. But you know, the way it wound up was, the series had all the heart and the movie was all comedy. I don’t know, it probably was closer to Saturday Night Live than it should’ve been. But we got the movie made. And the movie cost a lot of money. I think the fans were bugged. The fans were pissed off. They were hoping it would be more like the series. The new kids, the high-school and college kids today, it’s big on HBO and on DVD. I mean, we were No. 1 for two weeks on DVD. But we were unfortunate when we opened. We switched our date, because Harry Potter was moved into our date, and then we wound up opposite The Hangover, which we thought would be good. So they wound up scoring real big. SK: But we also learned one huge thing about our properties. You know, it’s like a studio buying a book, and then they take it, they put their own spin on it, and they ruin it, and people become really angry, because they really loved that book. I think that was a mistake we had. You really just don’t take away the important elements. Like Marty said earlier, the heart of the piece, it didn’t have that. And especially the fans, they become angered. MK: Well, you know, also… I want to get off Land Of The Lost, but everybody got excited walking on the stage and seeing the sets. I don’t know what the sets cost. $30 million? The bottom line is, that isn’t what makes the movie. MK: We’re at fault with this also. We produced this movie. You don’t have a lot to say once the director gets hold of it. But we got the movie made. MK: Well, I think enough of Land Of The Lost right now. SK: Well, but it has a lot to do with our next property, too. We’re being very careful and we’re watching over everything that’s being done right now. AVC: To touch on the original Lidsville for a moment, can you talk a bit about working with Charles Nelson Reilly, who played the evil Hoodoo? SK: Charles Nelson Reilly was a friend of mine and a very, very funny man, so he came in and did it. He didn’t want to. I think he was doing it as a favor to Marty and myself. He hated the idea of putting on that green makeup. But you know, he wasn’t really doing movies at the time. Wasn’t he just a comedian at that time? Yeah, I think he was just making appearances on The Tonight Show with Johnny Carson or whatever. But in Lidsville, he really created that character, that Charles Nelson Reilly character you know. MK: Yeah, well, he didn’t create that, Sid. He was that character. He played that character. That’s who he is. Or was. SK: No, that’s who he became after that character. He did Hoodoo all the time, not even knowing it. MK: Well, I don’t know. Okay. AVC: Is there a series that you’ve done over the years that you felt was particularly underrated? SK: Lidsville. You know, I loved that show, because it was so unique, so original. And it didn’t do as well as the other shows, and I think it was because of the competition. I don’t know if the kids just weren’t watching it as much. I don’t know what we were with Lidsville, but that’s a very, very original concept, you know? MK: The shows, most of them got 17 episodes, and then you got canceled because… well, whatever the reason. New program directors, maybe. But to catch on with 17 episodes is pretty rough, and we did it. And I think Sid is wrong about Lidsville. That wasn’t a poorly rated show at all. As a matter of fact, we got the highest ratings for women 18 to 39, for some reason. So that show, it wasn’t high on the list to have a movie made, I’ll tell you that, but when we went to DreamWorks, the head of development there loved Lidsville. He was very into Lidsville. His name was Bill Damaschke. He loved it. And then Conrad Vernon, who works for them a lot as a director, who did Monsters vs. Aliens and Shrek 2, he’s doing Pufnstuf for us, which is at Sony as a movie. And he brought it with us over to Bill at DreamWorks, and they loved it, and we’re immersed in that thing. And they’re a great company to work with. MK: Not just creatively, but they spend the money to get the best talent. So we’re in good shape with them. And Katzenberg, of course. Jeffrey is someone that I’ve gone back with and was close with back in the days of Paramount, back when he was there. AVC: As you mentioned, you’d made some prime-time appearances pre-Pufnstuf. Was it difficult to transition from Saturday mornings to doing prime-time variety shows? MK: Well, it isn’t once they say they want you to do it. [Laughs.] And after that, you go surround yourself with people who have that sort of expertise, which is what we did when we did Donny & Marie, which was the first one we did. Fred Silverman and Michael Eisner were at ABC at the time, and they wanted us to do it. SK: Fred Silverman saw Donny and Marie [Osmond] on an afternoon talk show, and he thought, “Oh, my God, they’d be great for a variety show!” And Fred loved us. He just thought we were so creative. And he came to us with that idea. And then we put together a whole concept for that show and flew to Provo, Utah, and presented it to the Osmond family. And the rest is history. AVC: Donny and Marie weren’t the only pop stars you worked with. You also did shows with the Bay City Rollers and Pink Lady. MK: I never heard of The Bay City Rollers. Only kidding. Well, Pink Lady was Fred Silverman’s idea, though of course, he said it was ours. [Laughs.] They were big music stars in Japan, but at the time, I think they had us opposite The Dukes Of Hazzard, so I don’t think we had a chance. The Bay City Rollers Show, that was another Saturday morning show that was… [Long pause.] To tell you the truth, that was the only show where we ever got canceled right in the middle of the run. Fred Silverman called and said, “I’m gonna do you a favor: I’m gonna cancel the show.” [Laughs.] So that was The Bay City Rollers. And that’s a whole separate story. Which you don’t have time for. For now, we’re working on the movies for Pufnstuf, Sigmund And The Sea Monsters, and Lidsville. Those are the ones that we’re putting a lot of energy behind. AVC: Lastly, I have to ask: Have you guys ever seen “The Altered State of Druggachusetts,” from Mr. Show? AVC: What did you think about it? MK: What did I think about it? I thought it was funny. SK: I loved it! It keeps us alive, you know? Even when people make fun of us. MK: We don’t care if they make fun of us. We don’t take ourselves that seriously.